A new study published in Global Change Biology challenges the idea that the trend towards larger, more intensive dairy farms mitigates climate change by shrinking the carbon footprint of milk production. A team of animal nutrition experts and environmental modellers from Bangor and Aberystwyth Universities looked beyond the farm-system boundaries of typical carbon footprint studies to account for indirect greenhouse gas (GHG) emission consequences considering changes to dairy feed production and to beef farms that may compete with dairy farms for grassland. 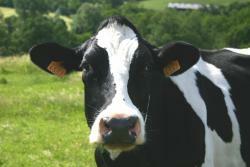 Milk and beef production are responsible for 9% of global GHG emissions. Previous studies have shown that dairy intensification reduces the carbon footprint of milk by improving feed conversion efficiency, but these studies didn’t account for indirect consequences arising within interconnected crop and beef farm systems. The authors of the Global Change Biology paper quantified these indirect effects for intensification scenarios in which average grazing-based UK dairy farms consolidate into large, intensive dairy farms that feed more maize and concentrates to cows. James Gibbons, lead investigator on the NRN Sêr Cymru funded “CLEANER COWS” research cluster, commented “When we began this research, we anticipated some potentially important indirect GHG emission effects arising from changes to animal diets, but as the research progressed, we revealed new and unanticipated secondary effects incurred within interconnected farm systems”. First applying a conventional foot-printing method, the authors found that intensification led to an apparent 10% reduction in the carbon footprint of each litre of milk produced, confirming the results of previous studies. However, when they expanded their accounting to consider indirect effects from maintaining beef production, they found that GHG emissions increased by up 43% following intensification. Notably, if reduced dairy-beef output in the UK is compensated by suckler-beef production at the “global beef frontier” in Brazil, a small reduction in UK GHG emissions is dwarfed by a large increase in Brazilian emissions – highlighting the risk that some intensification pathways may simply displace emissions to other countries. Conversely, if productive grassland spared by dairy intensification is used for intensive beef production, larger areas of lower quality grassland can be spared from extensive beef production, either in the UK or in Brazil, potentially leading to significant GHG mitigation through either afforestation or avoided deforestation. David Styles, lead author on the paper, concluded that “carbon footprints are useful to benchmark the efficiency of dairy farms, but could support misleading conclusions on the climate efficiency of ‘sustainable intensification’ strategies owing to hitherto poorly-quantified implications for inter-connected global food chains. Intensification of UK dairy farms is only likely to achieve significant climate mitigation when coupled with intensification of beef production, leading to net sparing of land for afforestation”. The authors caveat that their conclusions apply to further intensification of high productivity dairy farms in industrialised countries, and may not apply to intensification of low productivity dairy farms in industrialising countries where there is more potential to reduce carbon footprints by improving feed conversion efficiency among low-yielding dairy cows.